The Rift Valley Institute will participate in the Hargeysa International Book Fair (HIBF) panel event ‘The Wisdom of Elders’, to be held on 23 July in Hargeysa, Somaliland. Two South Sudanese chiefs from Aweil and Yambio, with whom RVI has been working as part of its South Sudan Customary Authorities (SSCA) project, will speak on this panel with two Somaliland Arts Council members, and RVI’s film, We Are Here for the Sake of the People will be screened. The Hargeysa International Book Fair—organized by the Hargeysa Cultural Centre (an RVI partner)—runs from 21-27 July. It has been held annually since 2008 and has grown into one of the biggest events of its kind in Africa. The theme of this year’s festival is Wisdom. For more on the 2017 fair, see here. 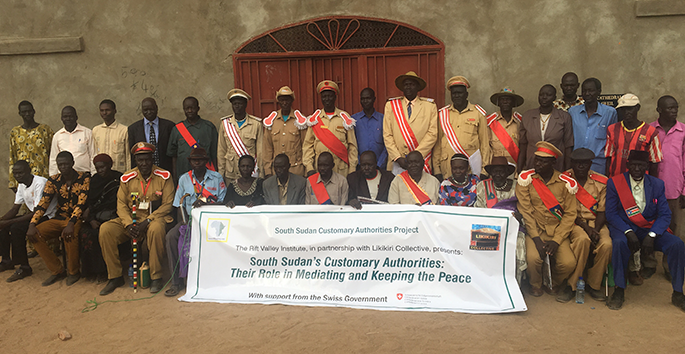 The South Sudan Customary Authorities project, which began in 2015, is one of RVI’s largest. It seeks to work with customary authorities —variously referred to as chiefs, kings and traditional leaders—to deepen understanding and highlight the ongoing significance of their historic and changing role in South Sudan’s contemporary political and social environment. To do this, the project has conducted research across the country culminating in a short film, blog posts and publications, including Nicki Kindersley’s recent, Politics, Power and Chiefship in Famine and War: A study of the former Northern Bahr el-Ghazal state, South Sudan. Several more reports will be published in the coming weeks. This research has been accompanied by ongoing dialogue amongst chiefs and with their constituents, and other national and international stakeholders. This has ranged from local level conversations between chiefs and youths to large scale chiefs’ meetings, such as at Kuron, and more recently events with youth in Aweil and Juba. These discussions have addressed issues from customary authorities’ role in mediating and maintaining peace, to their relations with the country’s youth. In addition, RVI will be transporting its project exhibition to Hargeysa for display at the book fair. The exhibition features information from the project including short biographies of some of the chiefs who have been involved and information from different research sites around the country, relevant documents from the South Sudan National Archives (with whom RVI works closely) and historic photos drawn from Durham University’s Sudan Archives and the South Sudan Museum Network.